Phones: +7 (8634) 62-62-42, 62-62-43, 62-62-44, 62-62-45. 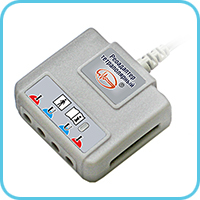 Electroencephalograph-recorder "Encephalan-EEGR-19/26" is the best universal tool for most tasks associated with control and diagnostics of the brain state at different neurophysiological studies and related fields. 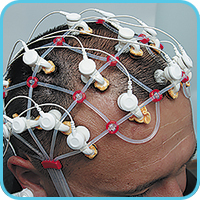 EEG studies can be carried out in attended or unattended mode. 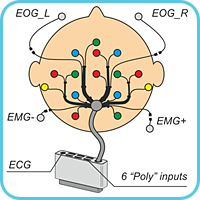 Connector EEG-20 provides switching between these modes (encephalograph transformation). 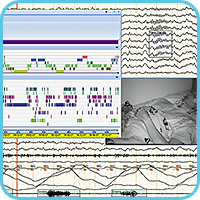 EEG-videomonitoring with an accurate synchronization of the EEG data and video record provides the "gold standard" of epileptological studies. 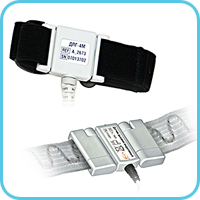 Holter-EEG is a 24-hour EEG monitoring at any patients location: in a hospital ward or at patient's home. Polysomnographic studies meet the requirements of international standards. The creation of sleep laboratories. Continuous multichannel neuromonitoring in the intensive care units and emergency room. 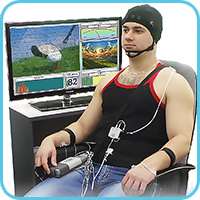 Neurofeedback with a detailed EEG analysis and control, as well as biofeedback training by various physiological parameters. Multichannel polygraphic registration of parameters (neuromodular systems with synchronous record of up to 50 data channels) in sports medicine and scientific research. 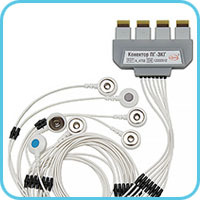 For stationary use for routine EEG studies with functional tests (phono-photostimulation) in the rooms of functional diagnostics and neurophysiology, insert ABP-26 into connector EEG-20, which allows using EEG electrodes of different types with touchproof connector (cup or bridge) or electrode system with cloth caps from the set of EEG electrodes ES-EEG-10/20 “Encephalan-ES”. 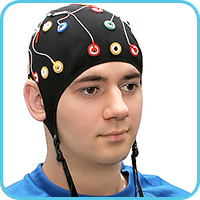 Comfortable placing of electroencephalograph-recorder near the patient is provided during EEG study. 1. 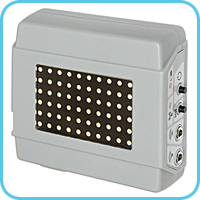 Autonomous patient transceiver-recorder ABP-26 inserted into connector EEG‑20. 2. 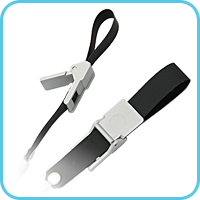 EEG-20 table support allows changing the connector's position. 3. 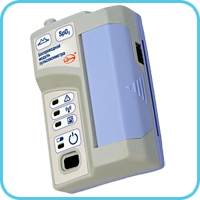 Wireless stimulator unit for the functional tests. 4. 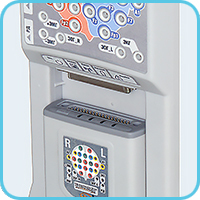 Table support for stimulation control for optimal placing in front of the patient. Headphones for phonostimulation are connected to the stimulation control unit. There is a system of fixation for wheels of electroencephalograph's trolley. 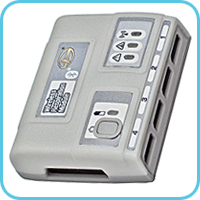 The front part – a panel with touchproof connectors for EEG, EOG, EMG electrodes. At the side - сonnectors for electrode system and respiration effort sensor. 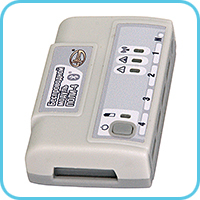 Patient transceiver-recorder ABP-26 is connected with to EEG‑20 connector using electrode system connector. 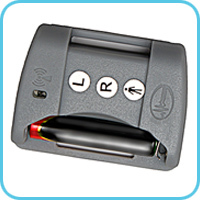 In this case, the power button and indicators of ABP-26 are available and visible to the user. 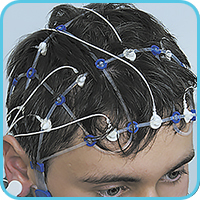 EEG‑20 connector gives a doctor an opportunity to use EEG electrodes or electrode cap during the studies. 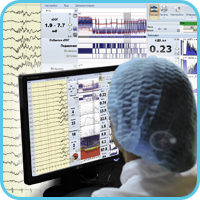 EEG-recorder is used for short-term and continuous EEG studies – in a hospital room or at patient's home, including EEG-video monitoring for the differential diagnosis of epilepsy. Portable electroencephalograph-recorder with SW EEG-studies "Encephalan-EEGR" allows safely and efficiently carrying out both short-term and long-term studies with topographic mapping and the use of modern methods of quantitative EEG data processing such as spectral, auto and cross-correlation analysis, the coherence function, mapping, identification of artifacts and seizure activity. Automatic forming of EEG description and classification. Editor of conclusions, electronic Cardfile and print manager help to save and document the results of studies. Evaluation of psychogenic disorders of not defined genesis, which are manifested under conditions of natural environment and behavior. Detection of pathological manifestations, such as paroxysmal epileptic states, transient ischemic attacks, and others. Differential diagnosis of epilepsy, types of seizure and syndromes, especially in irregular and illdefined paroxysm. 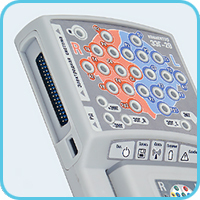 Continuous record of electroencephalogram (over 48 hours) onto the memory card integrated into the patient transceiver-recorder ABP-26, and a special set of electrodes "Encephalan-ES" provide comfortable carrying out of autonomous EEG studies (Holter EEG) in natural patient environment, both in a hospital ward or at home, during active wakefulness and sleep. During autonomous study, the device provides a unique opportunity for periodic functional tests in the telemetric mode required to induce controlled pathological manifestations. 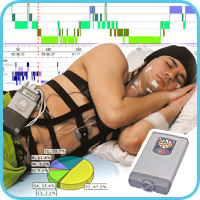 The main modification of electroencephalograph-recorder "Encephalan-EEGR-19/26" in combination with "maximum" suite of software "Encephalan-PSG" and necessary sensors forms polysomnograph with telemetric and autonomous (Holter-type studies) record for diagnostics of sleep disorder (insomnia, hypersomnia, parasomnia, narcolepsy), breathing disorders (sleep apnea syndrome, alveolar hypoventilation, snoring) and heart rate disorders, ischemic heart disease, neurological and psychosomatic disorders (epilepsy, restless legs syndrome). 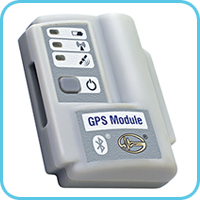 or additional wireless module PG-ECG: ECG-3; impedance-based pneumogram -1. 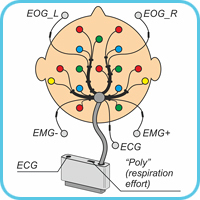 Additional POLY-4 module (1-2): abdominal and thoracic respiratory effort, respiratory airflow, snore, 2 EMG derivations, wired movement activity sensors – 2.
or additional autonomous patient transceiver-recorder ABP-10 (POLY-10 mode) provides a connection of up to 10 additional polygraphic electrodes in any combination. Reports, which contain data in tables and graphical form, are formed according to common international standards (AASM). Report can contain fragments of raw signals, selected phenomena, video data and parameters trends. 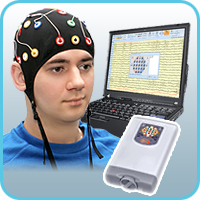 Software "Encephalan-EEGR" is used for Full-valid EEG analysis. "Maximum" software suit provides wide range of functional capabilities taking into account recommendations of the AASM and the CSM. Automatic search and differential diagnostics of central, obstructive and mixed sleep apnea. Presentation of sleep events in one time scale with trends of respiratory rate, nominal respiratory amplitude, nominal respiratory minute volume, SpO2, heart rate, mean and maximal amplitude of snoring signal. Reports with calculated indices of snoring, desaturation and respiratory disorders according to body position, with data on the change of oxygen saturation and heart rate as well as report form with data on body position in sleep. Manual or automatic hypnogram building using quick search of required fragments and trends of calculated parameters. Analysis of limbs movements for detection of restless legs syndrome. Software provides analysis of sleep phases, automatic building and manual editing of hypnogramms, and also allocation of sleep events, formation of sleep statistic reports and reports of sleep stages distribution. 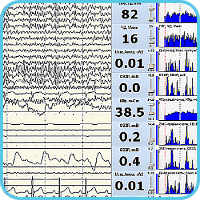 Marking of brain activity patterns for sleep stages determination (sleep spindles, K-complexes, saw-tooth waves), automatic calculation of sleep statistical indices (sleep scoring) and selected sleep events (indices, number and duration of episodes) are additionally provided. 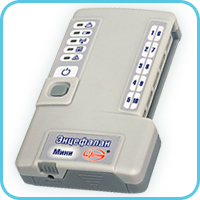 Portability of patient transceiver-recorder ABP-26, backup of all recorded data on the internal memory card and wireless data transmission to the computer provide high noise immunity from the effects of different equipment in the emergency room and intensive care units. Neuromonitoring with optional software "Encephalan-NM" is meant for long-term multiparametric monitoring for continuous analysis of EEG dynamics and other physiological signals in order to control the current state, for timely diagnosis of central nervous, cardiovascular and respiratory systems disorders, assessment of the anaesthetic depth and decision making on the necessary therapeutic interventions, etc. Cerebral functions monitoring with optional software "Encephalan-CFM" is used to assess the functional state of the brain and neurological status in patients with ischemic stroke and unconscious post-comatose states, to detect paroxysmal brain activity, its severity and frequency, and to control the dynamics of a patient state in therapeutic intervention and the states of asphyxia, low cerebral perfusion and brain damages in children (mainly newborns) as well as in adults. "Encephalan-CFM" and "Encephalan-NM" can be used separately as optional software to the main software "Encephalan-EEGR", but the most informative and effective monitoring of parameters is provided in at their simultaneous operation. improvement of the adaptive capacity and stress resistance, and psychoemotional sphere optimization. 12 or 20 EEG derivations providing greater possibilities for biofeedback and neurofeedback procedures by EEG and DC-potentials using quantitative methods of analysis (qEEG, aEEG). 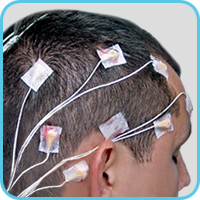 professional neurophysiological support using software for electroencephalograpical studies and additional software. Balance training while maintaining a vertical posture on a balance platform. Simultaneous operator performance training with tracing and logic task solving. 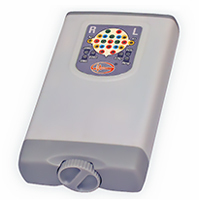 Training of the stress resistance skills using somatosensory stimulator. 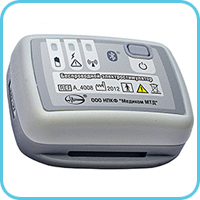 The main transceiver-recorder ABP-26 provides EEG record, obtaining data from wireless devices and sensors with saving information onto internal memory card during autonomous (Holter-type) working mode or provides data transition via wireless Bluetooth® channel to the personal computer during study carrying out. 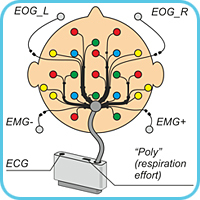 Original concept of unification of hard- and software for electroencephalographs-recorders "Encephalan-EEGR-19/26" provides a unique opportunity of combination of autonomous patient transceiver-recorder ABP-26 with additional modules and sensors, which allows you to create unified multifunctional neuromodular diagnostic systems with synchronous recording of more than 50 different signals. Record of signals by 10 polygraphic channels. Record of signals by 4 polygraphic channels. Record of respiration parameters by 4 channels. Record of arterial blood oxygen saturation using SpO2 sensors. (It can operate in autonomous mode). Record of data on movement activity in three dimensions. for tracking the position and motion path of a test person during autonomous studies. 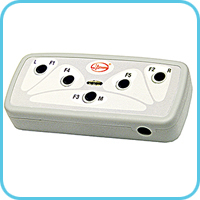 Patient button unit for detecting patient's response to presented stimulus. 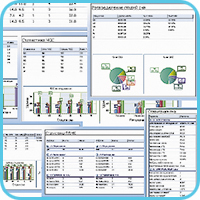 is used for cognitive EP studies (CNV, P300) and EP studies with audiovisual stimulation. 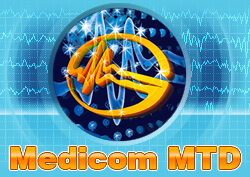 for functional tests on photostimulation during EEG studies in telemetric mode, and for phono-, electrostimulation (required headphones and wireless electrostimulator). for somatosensory stimulation for patient's responses testing in ICU, and for somatosensory evoked potentials studies. 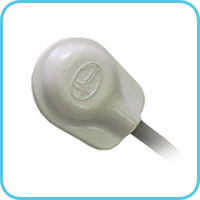 Set of EEG electrodes ES-EEG-10/20 "Encephalan-ES"
The external appearance of "Encephalan‑ES"
Electrode and a corresponding fixing slot are of the same colour. 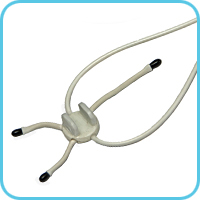 Conductors are grouped by hemispheres for comfortable distribution on the head. 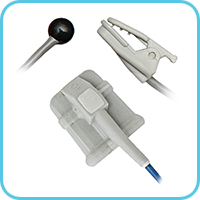 slots for ECG electrode and respiratory effort sensor. 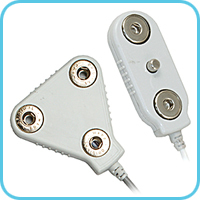 slots for 1 ECG electrode and 6 polygraphic sensors. evaluates parameters of abdominal and thoracic respiration (breathing rate and amplitude, duration of inhalation and exhalation phases) and detects breathing disorders. for evaluation of parameters of oro-nasal respiration (breathing rate and amplitude, duration of in- and exhalation phases) and detection of breathing disorders. 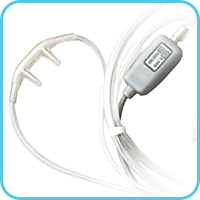 evaluates vegetative manifestations and emotional stress over phase component measurement. for study of central hemodynamics and heart's pumping ability by Sramek's method. for study of cerebral (REG) and peripheral (RVG) blood circulation, and evaluation of central hemodynamics parameters and heart's pumping ability by Tischenko's method. "HRV" Software for Heart Rate Variability Analysis provides evaluation of autonomic nervous system (ANS) state on the basis of HRV study. "Encephalan-EP" Software for EP-studies – provides long latency evoked potentials (EP) studies to stimuli of different modality (visual, auditory, somatosensory) with stimulators. "Encephalan-MPA" Software for multiparameter analysis of signals from polygraphical channels in combination with EEG signals (if additional wireless devices and sensors are purchased). 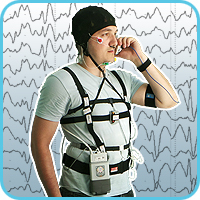 "Encephalan-PSG" Software for Somnological studies (if additional wireless devices and sensors are purchased). Software provides analysis of sleep phases, automatic building and manual editing of hypnogramms, and also allocation of sleep events, formation of reports of sleep statistics, sleep stages distribution and respiratory disorders. 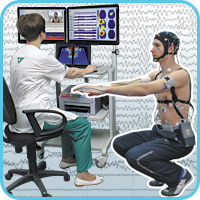 "Encephalan-AVS" Software for EEG and EP studies with audiovisual stimulation. Software provides flexible creation and playback of scenarios of cognitive stimulation using graphic images, audio files and text information as stimuli. Analysis of Very Low Frequency Activity "Encephalan-VLFA". 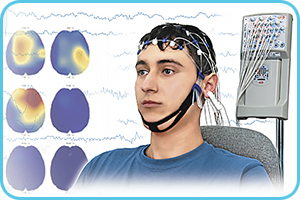 Software allows analyzing very slow EEG responses simultaneously with EEG recording by the same derivations. Three-dimensional localization of electrical activity sources "Encephalan-3D" displays a conditional source of electrical activity in the three planes of a brain cut in the form of a spatial cloud of dipoles, which allows us to localize the focus of epileptiform EEG activity or source EP components. Software for Functional Brain Asymmetry Analysis "Encephalan-FBA" provides visualization of cortico-cortical couplings maps by calculating the reciprocal functions (cross-correlation, cross-spectrum, the coherence function) for the diagnosis of inter- and intracortical dysfunctions, detection of the focuses of pathological activity, as well as for treatment monitoring. "Rehacor" Software for Functional Biocontrol with Biofeedback Training provides training and rehabilitation with biofeedback using various physiological parameters. It’s used for non-medicated reactivation of impaired functions, improving neural regulation, overcoming phobias and pathological addictions, optimization of psychophysiological state in athletes and people of stressful and responsible professions, as well as for overcoming attention deficit hyperactivity disorder in children and teenagers.